Along with a well-stocked pantry, I love a well-stocked freezer. It gives me the option to create meals on the fly and to save precious left-overs before ever getting sick of them. When it's my fourth meal of spaghetti and meat balls in a row, it's just not quite as exciting. In my book, one of the most essential components for a well-stocked freezer is chicken stock. 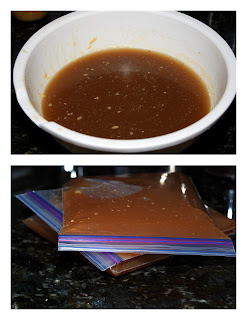 I like the convenience of stock in cartons (generally higher quality than canned stock), but homemade stock tastes so much better, is easy to make, saves money, and allows me to use up my leftover vegetables rather than throwing them away. Plus, whenever I open one of those cartons of stock I end up throwing half of it away because it sits in my fridge just a bit too long. So when I am relaxing at home on a crisp cold day, I will sometimes have a large pot of stock simmering on the stove top. Freezing it into meal-sized portions or individual cubes in zip-lock bags allows for months of convenient use in tasty meals. Here are some money and time saving tips: If you find yourself throwing vegetables out, STOP! Instead, freeze all those veggies (celery, carrots, tomatoes, onions, scallion, etc.) in a zip-lock bag and save them for your next stock-making day. For my stock I like to use chicken backs because they are cheap and give the stock an amazing chicken flavor, but you can also use necks or even the carcass from a rotisserie chicken. It's the bones that gives the stock its flavor and texture. Since we are only interested in extracting flavor and we'll strain out all of the solid matter, we don't have to do any fancy prep on the vegetables - just rinse them off, cut them into large chunks, and don't worry about the skins and stems. Pre-heat an oven to 500 degrees. Place the vegetables and chicken into a roasting pan, drizzle with the olive oil, and roast everything until golden brown, usually 30-40 min. 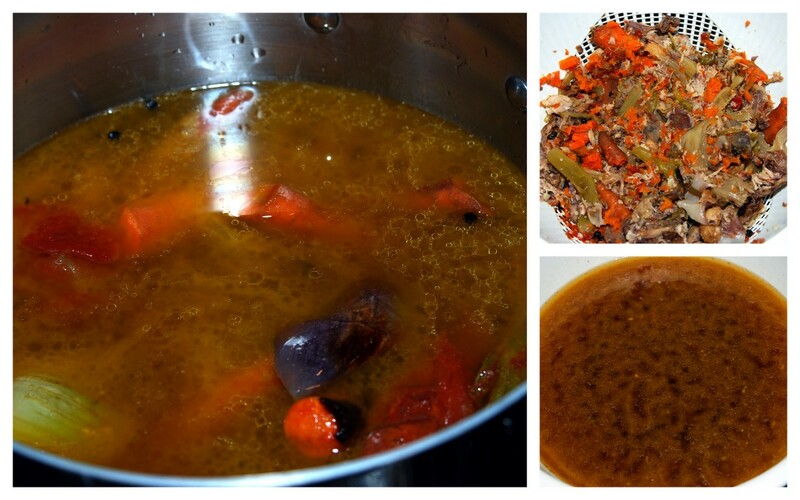 Once done, put everything into a large stock pot and add the remaining ingredients. 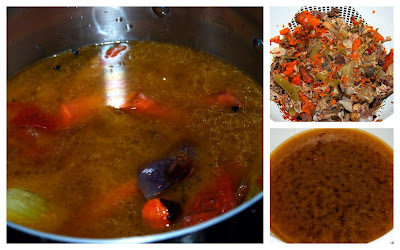 Bring to a boil over high heat, then simmer on low for 3-4 hours, keeping covered all the time. Afterwards, allow the stock to cool off heat for an hour. Strain the solids using a colander over a large bowl and press the solids with clean hands or a ladle to push out as much liquid as possible. Cover and refrigerate overnight. 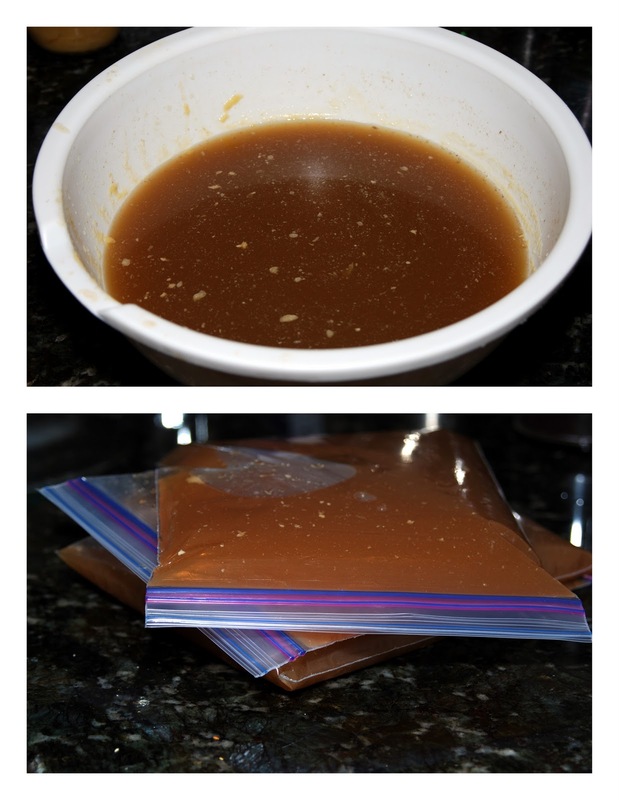 The next day, remove the solidified fat from the surface and portion the stock into zip-lock bags store in the freezer. You can also use an ice cube tray to make individual cubes that can be stored in a freezer bag. Make stock using turkey or beef bones with the same techniques, or make a vegetable broth by leaving out the meat. I never made stock, but have always wanted to try. Thanks for this!